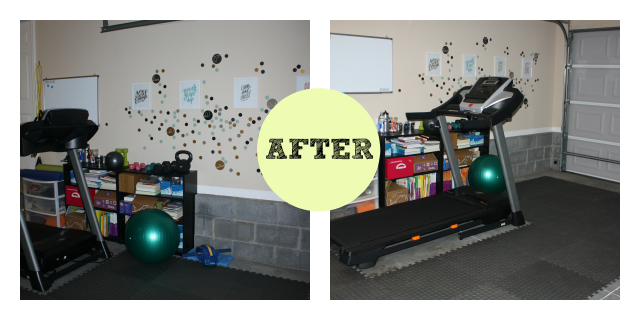 Last week, I shared the before pictures of our garage - half of which we have been working hard to convert into a home gym! Reveal time has finally come! 1 -- What gym would be complete without a dry erase board? This is my place to write up my workouts or goals! 2 -- Motivation Wall! The garage is not normally a place I enjoy being - so I needed to add a little bit of sass. What gym is complete without some inspirational quotes? I found these stickers at Hobby Lobby and framed them on cardstock. The frames and wall clings were an awesome find from Target. 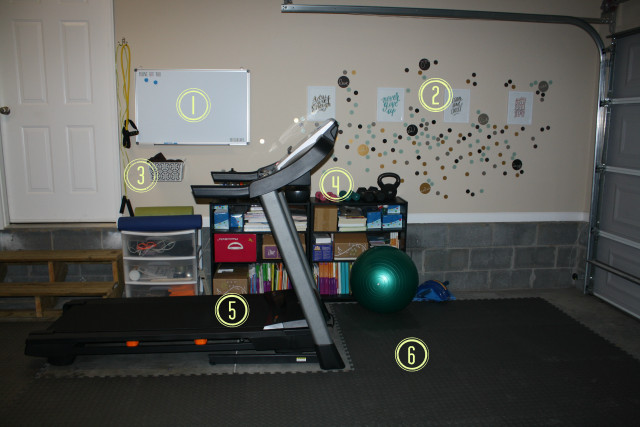 3 -- This area has several must haves: a basket for towels, a place to hang jump ropes and resistance bands, and some storage. 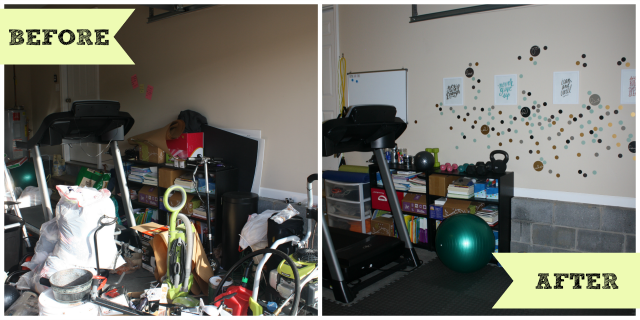 This is still a garage - so I still have to share the space. The bookshelves house all my curriculum for my job. 4 -- Equipment! Of course I have some of the basics - hand weights, kettlebell, medicine ball, ab roller, and stability ball. I already had most of the equipment - but didn't really have a place to use it. 5 -- A treadmill is a gym must! 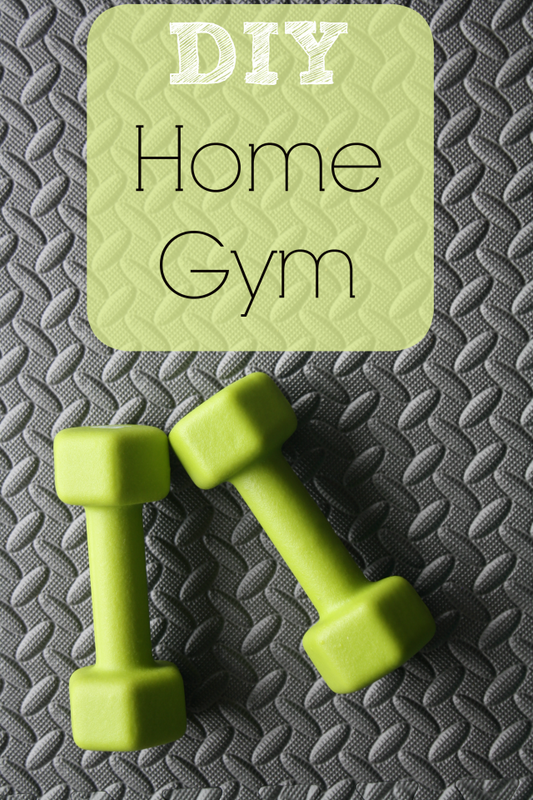 It's a great way to get in some quick cardio or steps on your FitBit! (You can often find less expensive ones on Craig's List or Facebook Yardsale Groups.) I love reading on the treadmill. Also, my husband got a Belkin @TV a while back -- so I am also able to watch TV on my Kindle Fire while I walk/jog. 6 -- Nobody wants to do sit ups on a hard, concrete floor. We added in some foam flooring we purchased at 5 Below for $3 a square! It looks amazing!! I love the area with the towels. You did a great job. :) I can't wait to work on our garage now. Thanks, Emily! It took a couple of trips to Goodwill & a few loads of trash, but I am pleased with the finished product. 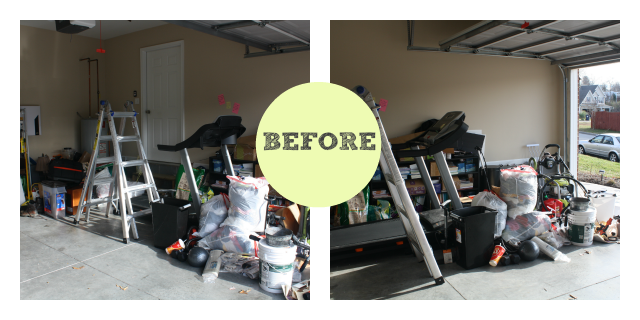 Definitely send me pictures if you makeover your garage! I was so excited when I found those - they were a nice finishing touch! I am following along - excited to see what you do! Awesome job! I love your motivational wall! Thanks so much! That's my favorite part, too! It looks really great Allison! loved this project! thanks for sharing! I've included it in my weekly roundup of favourite posts around the web :) thanks! Thank you so much! I will be sure to share! Thanks! I was thrilled when I found those polka dots a Target!